Rent a bike in Rotterdam they said, it’ll be fun they said. They forget to mention the utter craziness of navigating a vibrant city with your kids in tow. After one bike accident and one near accident, biking in Rotterdam with kids in tow is interesting, and fun, but can also be hectic and nerve racking. As an adult, I rarely ride a bike. I know how, but I may ride twice a year. The exercise bike at the gym does not count lol. But we’re in Holland. 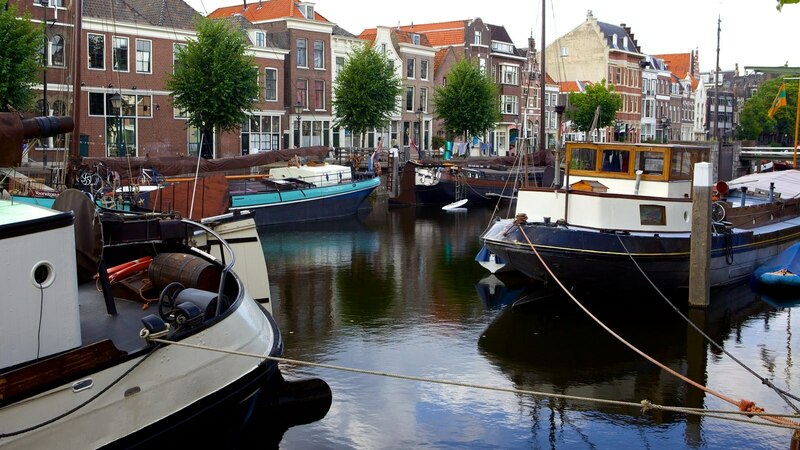 The Dutch are renowned for their ship building, canals, windmills, tulips and bikes. Biking is a way of life in Holland. So, to try and get an authentic experience when visiting Rotterdam, we had to rent bikes and ride through the city. At first we tried to find a two person bike (tandem) for an adult and child. Ensor is 5 years old and only recently learned to ride a bike. He’s still not very good. We didn’t expect him to handle a bike on his own in a country setting, much less a bustling metropolis. We should have taken that into account ourselves, hehehe we didn’t, but we should have. We visited around 5 bike rental shops in Rotterdam and couldn’t find a tandem bike. So we settled for a bike with a child seat on the back. Ensor was so disappointed, he was almost moved to tears. He hates being treated like a baby. He wants to do everything that we do without fail. In his words “he’s a boss” lol. (Gamer talk I’ve found out). But there was no other way we could ride. These are the some of the decisions you make traveling with kids. Picking suitable activities everyone can participate in and enjoy. It doesn’t always work out that way. Sometimes that’s how it goes. You have to keep moving forward and maybe the next activity will work better. To cheer Ensor up, we put our DSLR camera around his neck and gave him the job of official photographer. But now we have tons of blurry, and off center pictures of Rotterdam lol. Dutch bikes are the Cadillac or Mercedes-Benz of bikes. We rented each bike for 12.50 Euros per day, but the sale price is over €600. When you rent a bike, you can either buy insurance, or the rental company will hold a security deposit on a credit card. We rent our bikes, strapped Ensor in and ride into the city. Dutch bikes are built differently than I’m accustomed to. I’m use to riding mountain bikes etc. The handle bars are low, so you kind of hunch over when riding. Your weight is distributed more forward. Dutch bikes are more transportation focused. I see men in suits riding bikes as well as women in dresses riding bikes. On a Dutch bike, you ride straight up and the handle bars are breast high. This was a very uncomfortable position for me. But, when in Holland. Ensor decided he wanted me to ride with me. He weighs about 40 lbs (20kg). When I first got on the bike, saying I was unstable would be an understatement. An additional 40lbs (20kg) weight on the back. After I initially got on, I rode a little way in the parking lot, to test everything out. I was so nervous. I look back and Ensor is crying. OMG I’m scaring the children with my bike riding. Now, I had to make that a reality. Sydney and Gregory were ahead of me. Sydney at 10 years old, also had to get her riding still back together. Plus, her bike was kinda heavy for her. But my girl wrestled with that bike and rode. She too hates to fail at anything. Gregory keeps looking back at me with a very concerned look. Inside I’m screaming…”Noooooo”, but to him I say, “ Yeah, everything is fine. I’m coming….. Go on without me…. I’ll catch up…” lol. We finally exit the parking lot of time bike rental area right beside Rotterdam Central. Rotterdam Central looks straight out of a futuristic Sci- Fi movie. The glittering steel and glass building is in the shape of a boomerang (I’m sure that has some symbolism for the city). An architectural marvel in its own right. We get on the street, but didn’t have a map, so we just picked a direction with people, and a bike lane. A good thing about biking in Rotterdam is for most of the road, there is a dedicated bike lane, completely separated from car traffic with a sidewalk. So road — concrete barrier–bike lane–concrete barrier –sidewalk. The bad thing about biking in Rotterdam, motorized scooters share the bike lane. We follow the bike path from Rotterdam straight into town. It’s Gregory first, Sydney then me and Ensor. We had to cross a major street from the station, but there are 3 different lights. A light to signal a Tram is incoming. I didn’t know when to go. People who use biking as a means of transportation, and not a touristic ride through the city were coming at us in every direction. They were doing hand signals , you know the ones in your driving handbook that no one bothers to memorize. Yes ,those. Cars were coming, scooters were coming, bikes were coming, and people were coming. Plus I had a somewhat distrustful child strapped to to back of my bike, who was rightful concerned about his safety. I nervously wabble my way across the street. Gregory and Sydney is waiting for me on the other side. A guy in a bike overtakes me on my left, then had to stop inches from running into a car. I am beyond nervous now. I reach the other side, but I don’t stop. Gregory waved me on and said he’ll follow me. He must have seen how hard it was for me to get started. I get on a roll. I’m riding….. I’m riding…. Oh no, a truck. So I go around him. Then 2 scooters and 3 bikes overtake me. I guess I was going too slow. I get extra nervous when anyone rides next to me. Subconsciously, I veer towards them. So I had to put extra effort into not veering to my left and causing an accident. I’m getting to a busy square, pedestrians start walking across the street, my light is turning red, so I slam on my brakes at the last second to not hit the people. I put my feet on the ground to wait for the light, then BAM!!!. I look behind me and Sydney crashed her bike right into the back of mine. I turn as she falls slowly to the ground holding her head. The pedestrians I almost hit, ran around to Sydney and helped her up. They help Sydney up and we make it across the street. Gregory is visibly shaken. He starts lecturing Sydney on driver safety and following too close. I thought, at least she crashed on a bike and not when driving a car. This lesson will serve her well, if she remembers it. Off we went. We rode all through Rotterdam. No map, but staying on bike paths, away from the crowds and the busy sections of town. We ended up passing the euromast, then ended up in one of the most idyllic parks ever. Vibrant green grass and trees, weeping willows beside ponds with ducks. Some ponds had small curved wooden Bridges, so you could cross. A few groups of people sat on the grass reading, some were playing music and some were barbecuing. It was a peaceful stop to a hectic ride. We stopped in the park. The kids played by the pond and the parents took pictures. The Cube Houses (or Pole Houses or Tree Houses) designed by architect Piet Blom are part of the Blaakse Bos development which borders on the Laurenskwartier district and the Waterfront area. The Kijk-Kubus (Show-Cube) is a furnished museum house, specially designed and constructed to let the visitor experience what life is like in a Cube House. Models, photo-panels and screens provide extra information about the Blaakse Bos housing development. But there are actual cube houses that people live in. We ride around the cube house of Rotterdam and other unusual but striking architectural Marvel’s. Then we needed to get something to eat, because we have kids in tow, and they’re always hungry. We looked at the skyline to find our hotel and headed in that direction. But, we passed our hotel and kept going because there was a ramp down to ride next to the canal, and we didn’t want to miss it. We rode along the canals pass water taxis in the river and large ships docked on the side. All I could think of, was thank God, Ensor didn’t have his own bike. He would have surely rode into the river. There was no barriers to stop you from doing so. Delfshaven, a borough of Rotterdam, survived the Rotterdam Blitz in 1940, leaving its centuries-old buildings intact. We ended up at one of the oldest sections of Rotterdam. One of the few surviving areas after Rotterdam was bombed during WWII. It had cobblestone streets and Dutch style homes on either side of a canal. This charming neighborhood was once an independent town before being annexed by Rotterdam in the 19th century. On our way out, I’m riding first, Sydney is behind me and Gregory is last. We’re riding on a small street. A car is coming towards us. A car is coming behind us. The car behind us tries to get in front of us, so he doesn’t have to wait for the oncoming car to pass, and almost hit my daughter.The car jams on his break at the last second. I think Gregory yelled some choice words at the driver as he drive off. Witte de Withstratt in Rotterdam is a very hip and vibrant cultural street with many art galleries, popular bars, restaurants and shops that are slightly different. The wonderful atmosphere of the Witte de Withstraat street is enhanced by the many terraces, bars, restaurants and trendy shops on the street. Everywhere was packed. The kids were starving at this time and all they wanted was a cheeseburger. We parked the bike, locked them up and tried to find a cheeseburger. There were a few places, but they were packed and we had a wait. So we opted for Indonesian food. They have rice and the kids will usually eat rice. It was only until after Gregory’s second whisky that he admitted he was on edge all day. Riding a bike through Rotterdam with your kids in tow can be a nerve racking expedition. We get back to the hotel where we were able to keep our bike for the night, locked up and safe. As we were locking our bikes away at the hotel, we told the concierge about our day. I wonder if we knew that, would we have gone. I’m happy we did. It was a great way to see the city and an exciting, albeit dangerous adventure. I can’t imagine how renting a bike in Amsterdam would be. Lol. Always lock up your bike. Don’t leave your bike in a public place overnight even if it’s locked if you can help it. Ask for a helmet if you’ll feel more comfortable. Get your bearings before you take off. Understand the lights, and watch out for trams in both directions. Although riding a bike through Rotterdam was hard, initially it got better. People were usually non aggressive and are just going about their day. As with Sydney’s accident, people will help. Most people speak English, so asking for help or directions should also be Ok.
Rotterdam is beautiful, but not in the Amsterdam way, or in the Dutch countryside way. Rotterdam is beautiful in its own right. 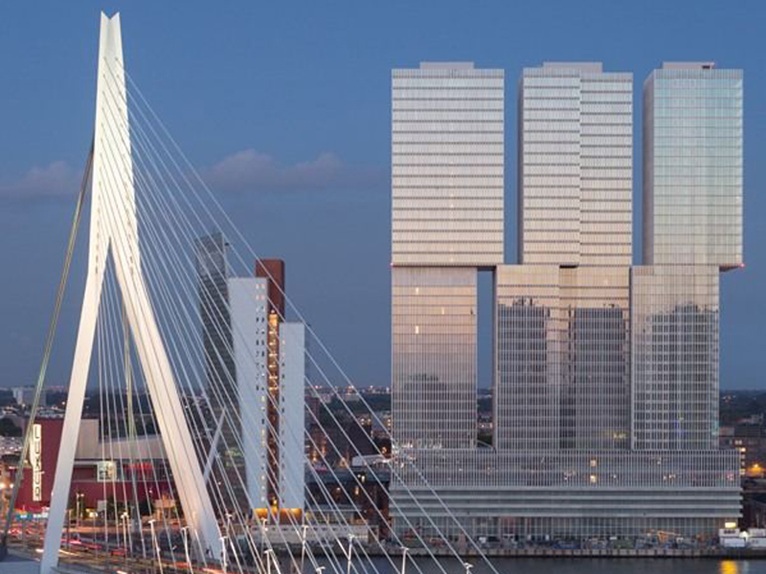 But the thing that separates Rotterdam from many cities is it’s modern and daring architecture and embrace of technology and the future. So many people are looking to the past, but Rotterdam has a commitment to look to the future. Traveling by bike is a great way to see this unusual city. Glad you guys are safe and sound! 🙂 Riding a bike in a city is definitely up there as one of my fears as I am a clumsy turtle. Also, I don’t know how to ride a bike, so there is that. I love biking, i do a little more than two a year. Its great for your heart they say. Amazing pictures. Sounds like you had quite the adventure! Do you feel like biking was an effective way to tour or would you suggest an alternative? Y’all had quite an adventure. I must say that I am absolutely jealous! Wow! What a beautiful city. I love the pics. Riding bikes around any European city is definitely a must. What a fabulous experience for your family! The fun you had was very evident in the faces of your kiddos! Wow great post…keep up the good work! “Dutch bikes are the Cadillac or Mercedes-Benz of bikes.” Haha I just love that! Thank you. Rotterdam is a great city to visit. I know Amsterdam is the draw for The Netherlands, but Rotterdam is a unique city that shouldn’t be missed. hahaha, and they are almost as expensive, lol. Rotterdam is so beautiful and modern. I don’t consider myself into Architecture, but everywhere we went, we would see an unusual building. It’s really modern. It was really cool. The kids enjoyed it. We did too, but with tons more anxiety. It was an adventure hahaha. We didn’t think it would be when we left the hotel. Visit, you’ll love it. For Rotterdam, seeing the city by bike is great. You can ride almost everywhere, and stop and park you buy anywhere to explore. So, yes. But you have to take into account how it is to ride through Rotterdam. I would stay away from the busy areas and ride off the beaten path so to speak. I also think a water taxi, or a boat tour around the canals and waterway is a also a good way to see a different side of Rotterdam. Thank you. Do you do long distance biking? Like 30 – 40 km from one city to the next? We’re thinking of doing that later in the summer. Thank you. hahaha it was crazy. Thank you. hahahaha. Yes you’d have to learn to ride first. But they have some 3 wheel bikes that look cool. Rotterdam is nice, you should. Put it on your bucket list. We don’t bike here with helmets but they should’ve given you the option for one especially for the little ones. It reminds me of Curacao! Great pics. What a wonderful experience for your kids! We are traveling to Europe this summer for the first time. So excited to see the gardens and architecture. Any tips for traveling with kids? How awesome! Europe is really nice for a family trip. 1) Try to get them to sleep on the plane, but tiring them out before hand. If you have a night flight, all the better. 2) Tablets, books, playing cards, etc that the kids like, to keep them occupied on the long flight if they are not asleep. 3) Include them in the planning (If they are old enough to understand) Ask them what they would like to experience and why. That way, they are more invested in the trip. 4) Don’t pack too heavy. You may want to shop for clothes while in Europe. In some countries, clothing is inexpensive. You don’t need to bring everything. Plus, depending on how long you’ll be in Europe, you could usually find a laundromat. 5) Finding food can be a hassle if your kids are picky eaters. But, many cities have the standard Pizza, Pasta, and Cheesburgers lol. 6) Remember, kids are more adaptable than we are. They’ll do great. Really! My husbands ancestors are from Curacao. It was Ok. When in Holland. But, I was surprised we didn’t get an option of a helmet, and we forgot ourselves. I’ll remember next time to ask. That’s why the kids think that moms are superheros! Great post! I haven’t been biking in a long time. I miss it. What an amazing experience for you and your family. Thank you, I appreciate it.! I really happy to find this site on bing, just what I was looking for : D likewise saved to my bookmarks. I have been absent for a while, but now I remember why I used to love this blog. Thank you, I¦ll try and check back more frequently. How frequently you update your website? I like rock bands! I really do! And my favourite rock band is Hootie&Blowfish! All band members has came together to perform more than 50 concerts to their fans in 2019! To know more about Hootie&Blowfish in 2019 visit website Hootie and the Blowfish tour Los Angeles. You won’t miss concerts in 2019 if you visit the link! New Kids on the Block is my favourite band of 90s. They had so many hit songs! The ones I remember are ‘Tonight’, ‘Baby, I Believe In You’ and their hit ‘Step By Step’. These are real songs, not fake like today! And it is sooo good they have a tour in 2019! And I’m going to attend New Kids on the Block concert in 2019. The tour dates is here: https://newkidsontheblocktour2019.com/. Click on it and maybe we can even visit one of the concerts together! Backstreet Boys BSB are an American boy band. The band was founded on April 20, 1993 in Orlando, Florida, by Lou Pearlman. Now this is the most successful band with more than 100 million records sold worldwide. The group was named after a flea market in Orlando, the “backstreet flea market”. In 2019 BB has more than 50 concerts in the US with their DNA tour. Check concert dates at Backstreet Boys tour Birmingham website. Full list of tour dates & concerts! Carrie Underwood is my favourite US singer. She is young, beautiful and charming woman in her 30s. Her strong voice takes me away from all issues of this world and I start enjoy my life and listen songs created by her mind. Now the singer is on a Cry Pretty 360 Tour started in May of 2019. The concerts scheduled for this year, up to the 31st of October. Tickets are available for all men and women with different income. If you love country music as mush as I, then you must visit at least one Carrie’s concert. All tour dates are available at the Carrie Underwood tour Memphis. Open the website and make yourself familiar with all Carrie Underwood concerts in 2019!